The Forum in ca. 200 BC. View from the east. The Forum in ca. 200 BC. View from the north-east. The Forum in ca. 200 BC. View from the north-west. The Forum in ca. 200 BC. View from the west. The Forum in ca. 200 BC. View from the south. The Forum in ca. 200 BC. Topographical overview. The Forum in ca. 200 BC. View from the south-east. The Forum in ca. 200 BC. View from above. The transition from the 3rd to the 2nd century B.C. marks a turning point in the history of the Forum, as it underwent fundamental changes in the subsequent decades of the 2nd century B.C. At first glance, the structuring of the Forum still seems to be very dependent on the previous history of the square. And a first glance at the model suggests that hardly any improvements were made to the square compared to its appearance at 250 B.C. (see Middle Republic). However, if one looks at individual elements more carefully, then these seem to foreshadow some experimentations with the square’s design that were yet to come: They were reacting to the growing deficiencies in the usability of the Forum as a public and political center for the rising power Rome and looking for future-oriented solutions. That these experiments were to be successful was shown by the subsequent phase (see Late Republic II): Only a few decades later, the appearance of the Forum changed in a very impressive way, making the old Forum hardly recognizable. But even though this noticeable break in the history of the Forum is often said to have occurred during the remainder of the 2nd century B.C., the actual course leading to this change was already set around 200 B.C. A defining feature of the Forum around 200 B.C. was its division into two distinct spatial segments. These were separated by a canal, the Cloaca Maxima, that had not yet been closed over and ran right through the Forum square: Since time immemorial the canal, which ran from north to south, divided the area into two halves: The western half, which was dominated by the area of the Comitium as well as the Curia in the north-west corner, could be perceived as the political center of the Forum, whereas the eastern half, with the Regia, the Temple of Vesta and the Temple of the Dioscuri, functioned more as the sacred center of the Forum. 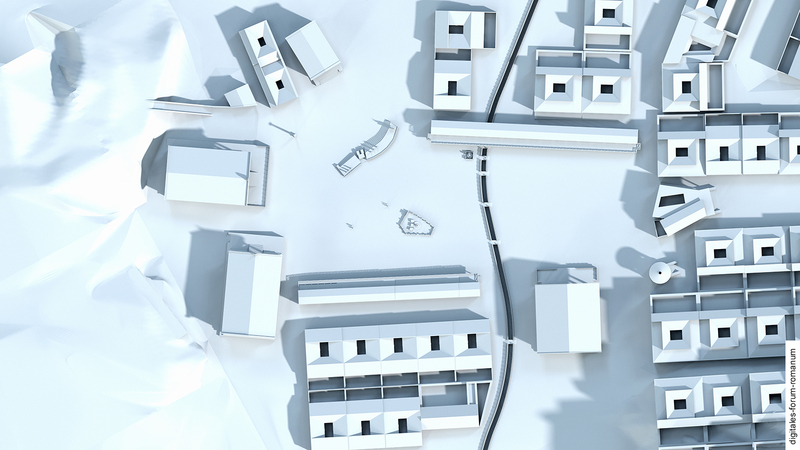 Just like the Cloaca Maxima, the adjacent buildings indicated that they were of an older historical origin. 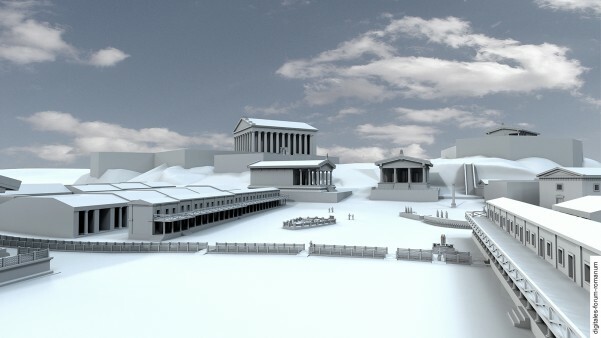 The temples – the Temple of Saturn in the south-west corner, the Temple of Concordia on the west side and the Temple of the Dioscuri as well as the Temple of the Vesta in the south-east corner – still largely resembled the visual appearance of the previous temple architecture of the 5th and 4th century B.C. 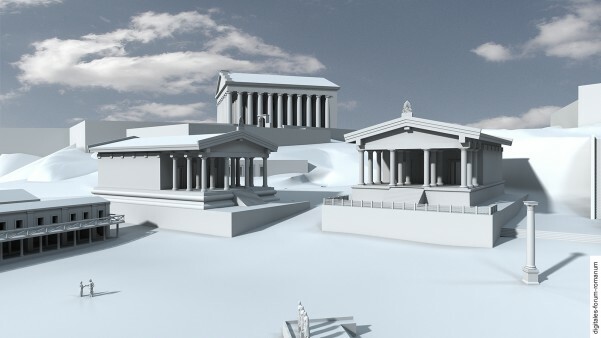 and exhibited no similarity to the contemporary trend of Hellenistic temple architecture (which was later massively embraced in the 2nd century B.C.). And also the old Curia Hostilia, next to the Comitium, and the Regia on the east side still seem to have retained their architecture from the 6th and early 5th century B.C. Only the Tabernae argentariae, which had been newly designed in the late 4th century B.C. with balconies for viewing the celebrations, games, processions and state ceremonies that took place on the Forum, as well as the Comitium, which was rebuilt in the early 3rd century B.C. with a curved speaker’s platform, are examples of changes that were made to the Forum for purposes of political representation. It is revealing that the restructuring of the Tabernae and the resulting focus of mercantile activities on money exchange was seen as increasing the square’s grandeur at the time. Strictly speaking, however, this increase in visual grandeur was a result of concentrating certain actions on the Forum, rather than of any outward characteristics of its dominating architecture. In light of the rather underdeveloped appearance of the Forum architecture it is easy to imagine the growing dissatisfaction of Rome’s leading politicians and generals when they compared the political center of their city with those of the major Greek cities of Southern Italy and the Hellenistic East. And the foreign rulers and legates, which visited Rome more and more frequently, will also have been irritated by the dissonance between the rather simple appearance of this urban square and the political aspirations of Rome. 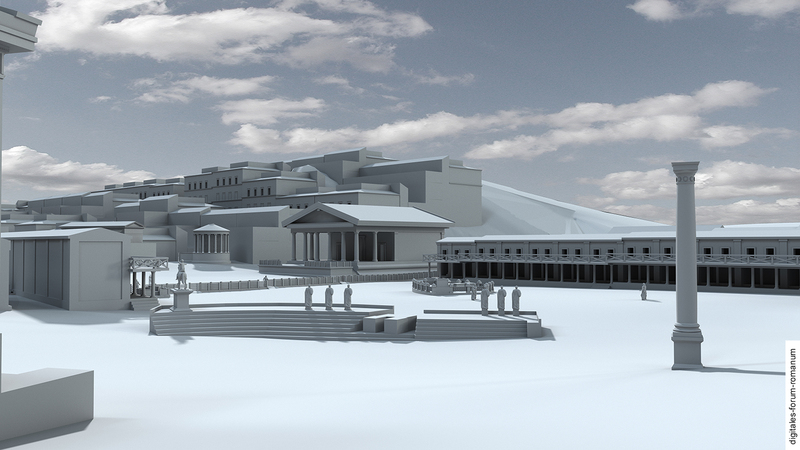 This dissatisfaction was one of the major incentives for the reshaping of the Forum, which began soon after 200 B.C. and led to its transformation into a first-rate Hellenistic square (see Late Republic II). An initial reaction to this dissatisfaction can be observed shortly before 200 B.C. on the Forum. At that time, an initial basilica was built (after a fire had destroyed parts of this area around 200 B.C.) on the north side behind the Tabernae novae; this basilica [which has not been integrated into our model yet …] is commonly understood as the forerunner of the Basilica Fulvia. 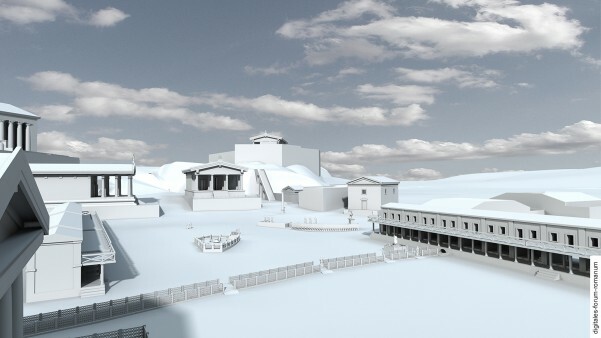 This novel idea of constructing multifunctional halls, which also led to a new kind of architectural splendor on the Forum and strengthened its claim as a space of representation, had a promising future: In the 2nd century B.C., the basilica became a kind of architectural leitmotif, erected multiple times on the Forum (see Basilica Porcia, Basilica Fulvia, Basilica Sempronia, Basilica Opimia). Apart from the dissatisfaction with the unrepresentative appearance of the Forum architecture, further discontent emerged around 200 B.C. : It concerned the use of the Forum as a stage of political communication, for which the area of the Comitium was becoming increasingly ill-suited. 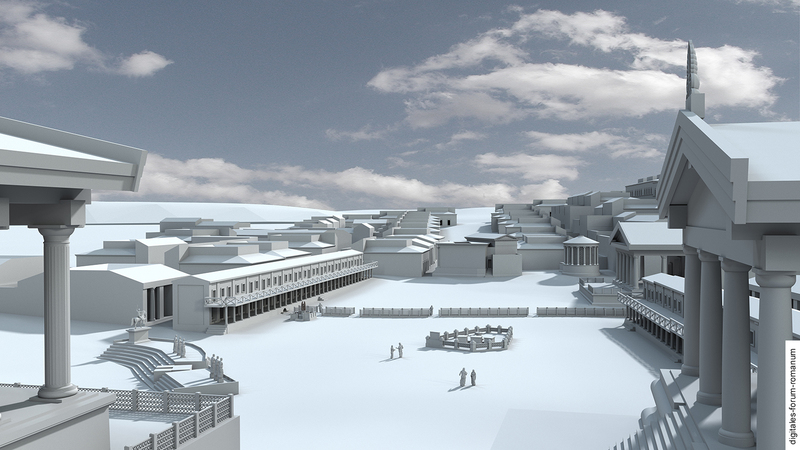 Although the Comitium had been expanded in the 3rd century B.C., it quickly became clear that the assembly area was no longer suitable for the citizenry of the then prosperous and growing city. Here also a simple, but significant solution was found, probably around 200 B.C. : A speaker’s platform was built into the front of the Temple of the Dioscuri, thereby creating a second assembly area for the people in addition to that of the Comitium – and this second area actually better fulfilled the functional demands of such a political space, as its speaker’s platform enabled the people to convene on the extensive space of the Forum. This allocation of an extended area to the assembly of the people, now free from the narrow space previously allotted by the Comitium, was also to have further severe consequences for the staging of political communication on the Forum. 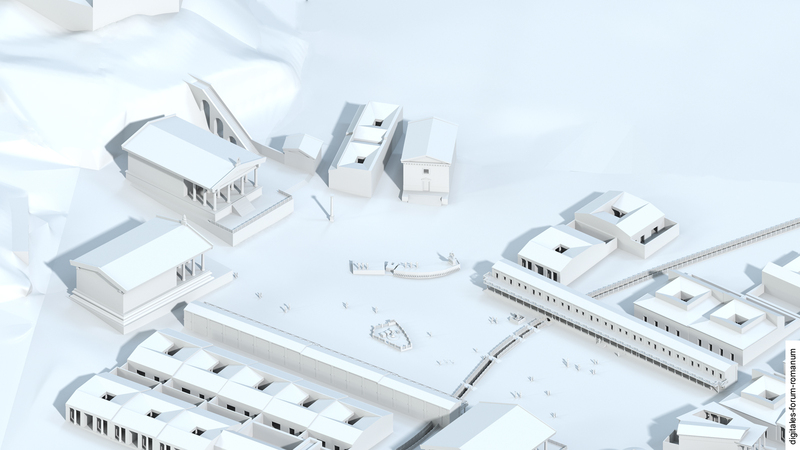 In the end, the closing of the open canal of the Cloaca Maxima was to be the smallest architectural change within the further construction of the Forum in the 2nd century B.C. F. Coarelli, Il Foro Romano II. Periodo repubblicano e augusteo (Rom 1985). K. S. Freyberger, Das Forum Romanum. Spiegel der Stadtgeschichte des antiken Rom (Mainz 2009) 31-50. K.-J. Hölkeskamp, Senatus Populusque Romanus. Die politische Kultur der Republik – Dimensionen und Deutungen (Stuttgart 2004). T. Hölscher, Die Anfänge römischer Repräsentationskunst, Römische Mitteilungen 85, 1987, 315-357. T. Hölscher, Die Alten vor Augen. Politische Denkmäler und öffentliches Gedächtnis im republikanischen Rom, in: G. Melville (Hrsg. ), Institutionalität und Symbolisierung. Verstetigungen kultureller Ordnungsmuster in Vergangenheit und Gegenwart (Köln – Weimar – Wien 2001) 183-211. T. Hölscher, Das Forum Romanum, die monumentale Geschichte Roms, in: E. Stein-Hölkeskamp – K.J. Hölkeskamp, Erinnerungsorte der Antike. Die römische Welt (München 2006) 100-122 (108-110, 112-113). F. Kolb, Rom. Geschichte der Stadt in der Antike² (München 2002) 188-189, 204-208, 219, 245-247. 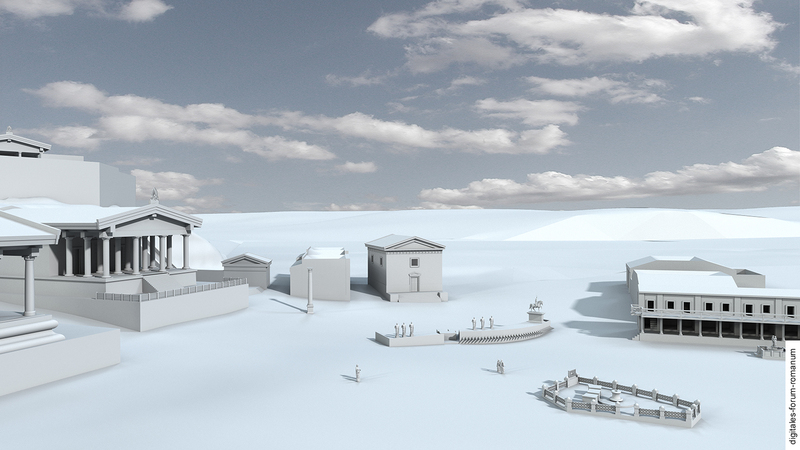 S. Muth, Historische Dimensionen des gebauten Raumes. Das Forum Romanum als Fallbeispiel, in: O. Dally – T. Hölscher – S. Muth, R. Schneider (Hrsg. ), Medien der Geschichte – Antikes Griechenland und Rom (Berlin – New York 2014) 285-329 (296-315). N. Purcell, Forum Romanum (The Republican Period), in: E.M. Steinby (Hrsg. ), Lexicon Topographicum Urbis Romae II (Rom 1995) 325-336. K. E. Welch, Art and Architecture in the Roman Republic, in: N. Rosenstein – R. Morstein-Marx, A Companion to the Roman Republic (Malden 2006) 496-542.